The Honda Ridgeline is the second generation of Honda’s innovative midsize pickup truck, redesigned from the ground up to offer both recreational and work users a higher degree of utility and versatility in a modern, rugged and sophisticated midsize pickup with the largest and most flexible cabin in its class; a higher level of confident and refined dynamic performance; and robust cargo-hauling and towing capabilities, including a class-leading maximum 1,584 pound (718.5 kg) payload capacity (varies by trim) and up to 5,000-pound (2,268 kg) towing (RT AWD). Based on Honda’s Global Light Truck platform – with its highly rigid, aerodynamic and tightly sealed unitized body construction, Advanced Compatibility Engineering™ (ACE™) safety body structure, and fully independent front and rear suspension systems with Amplitude Reactive Dampers – the Honda Ridgeline offers vastly superior ride comfort and handling precision compared to conventional body-on-frame truck offerings, along with the top-in-class cabin quietness and anticipated collision safety performance. Combining this new platform with a more powerful and efficient direct-injected 3.5-liter i-VTEC™ V-6 engine, a 6-speed automatic transmission with wider ratio spread, and available new Intelligent Variable Torque Management™ (iVTM-4™) torque-vectoring all-wheel drive – the most advanced AWD technology in the midsize truck class – results in class-leading EPA fuel economy ratings along with superior all-weather traction and handling capability and robust medium-duty off-road performance. 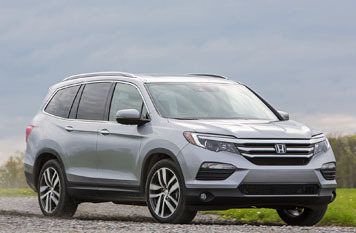 The Ridgeline also offers customers more choices than ever before including, for the first time, both two-wheel-drive and all-wheel-drive options, as well as an expanded array of standard and available premium features and technologies, including a new 8-inch Display Audio touchscreen with Android Auto™ and Apple CarPlay® compatibility and new generation of Honda Satellite-Linked Navigation System™. A wide array of new standard and available equipment includes Tri-Zone Automatic Climate Control, Push-Button Start, Remote Engine Start, Smart Entry, a power sliding rear window, LED exterior and interior lighting and more. Both the Honda Ridgeline RTL-E AWD and the Honda Ridgeline Sport AWD models will be on display.